Stephen Colbert's announcement Thursday night that he is exploring a presidential run has meant publicity for the comedian - and the role being played in this election cycle by so-called super PACs, which Colbert winkingly describes as "100 percent legal and at least 10 percent ethical." But that doesn't mean South Carolina Republicans should expect to be able to vote for Colbert when they head to the polls next Saturday in the next nominating contest on the primary calendar. On his Comedy Central program Thursday night, Colbert announced he is forming "an exploratory committee to lay the groundwork for my possible candidacy for the president of the United States of South Carolina." Onscreen a graphic read, "I'm Doing It!" Yet Colbert could not get on the ballot in South Carolina - the November 1 deadline for doing so has come and gone - and the state does not provide a space for write-in votes in primaries. "South Carolina state law does not allow any write-in ballots in presidential primaries. There is no blank space on voting machines to write in a candidate," said Matt Moore, executive director of the South Carolina GOP. He added: "Stephen Colbert has about as much chance of being elected president in South Carolina as he has of being elected pope." Colbert, who tried to run for president in South Carolina in 2008 but was unable to get on the ballot, has been pointing to a recent Public Policy Polling survey that found him polling ahead of Jon Huntsman in the state. Ballot access rules vary from state to state. It's possible that Colbert could get on the ballot in states where deadlines have not passed, and/or get write-in votes in states that allow such votes. But getting on ballots is an arduous, time consuming process - just ask the major GOP candidates who have failed to do so in various states - and it's unlikely that Colbert would attempt to do so for what is essentially a joke. 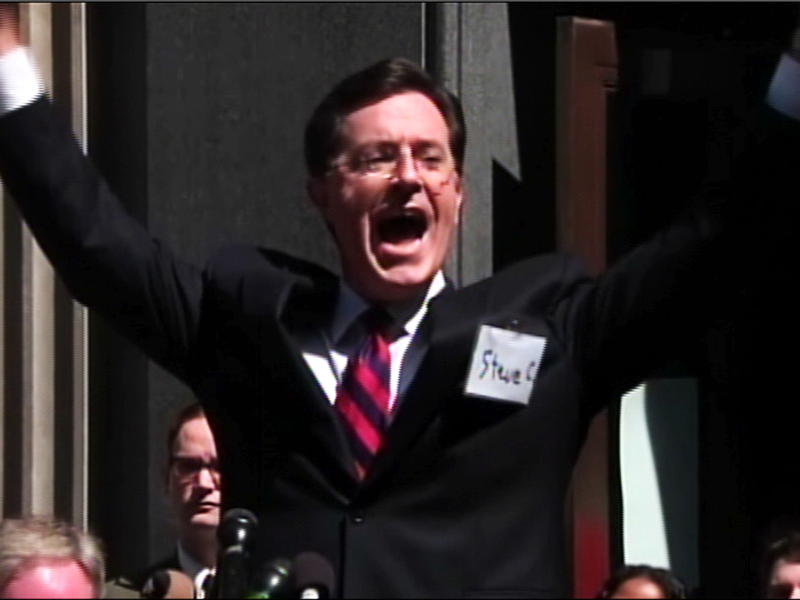 The real significance of Colbert's announcement may be the spotlight it puts on super PACs, into which donors can pour unlimited money in order to support or attack candidates, and thus influence election outcomes. Super PACs were made possible by the 2010 "Citizens United" Supreme Court decision that effectively classified money as speech. The groups are technically unaffiliated with the candidates, and they cannot legally coordinate with them. Yet they have been doing the dirty work for candidates in this election cycle: In Iowa, a super PAC backing Mitt Romney ran millions of dollars in attack ads attacking Newt Gingrich's "baggage," and a pro-Gingrich super PAC, flush with a $5 million donation from a Las Vegas casino mogul, is now going up with attack ads hammering Romney's record running Bain Capital. On his show Thursday, Colbert handed over control of his super PAC to his Comedy Central compatriot Jon Stewart, who mocked the notion that super PACs and campaigns don't coordinate: The host of "The Daily Show" quipped in a press release that "Stephen and I have in no way have worked out a series of morse-code blinks to convey information with each other on our respective shows." Stewart and Colbert are not alone in questioning the line between Super PACs and campaigns: Calling on Romney to get the attack ads against him off the air last month, Gingrich said "don't hide behind some baloney about this super PAC that I actually have no control over that happens to be run by five of my former staff. That's just baloney." Super PACs backing candidates - including the ones backing Gingrich and Romney - are often run by people who used to work for the candidates. Joined by his lawyer Trevor Potter, a former chairman of the Federal Election Commission, Colbert gleefully mocked the supposed division on Thursday night, noting he could still volunteer on behalf of the super PAC, now called "The Definitely Not Coordinated with Stephen Colbert Super PAC." Stewart, Colbert and Potter put their hands together and shouted in unison: "Non-coordination!" Colbert's super PAC - previously called "Americans for a Better Tomorrow, Tomorrow" - first ran ads in Iowa in August calling on voters to write in "Rick Parry" on ballots ahead of the Iowa Straw Poll, misspelling the name of Texas Gov. Rick Perry with an "a" - "for America." Colbert also has another group - incorporated as a 501(c)(4) - that can dump unlimited anonymous donations into his super PAC; he used that to fund ads to back the owners in the NBA lockout.